Still, technically, has CD Check enabled. See issues fixed for disabling it. To improve DOSBox performance, make some changes to the DOSBox configuration file. If you still suffer from poor performance, try changing cycles=auto to cycles=max. You may need to use Ctrl+F11 and Ctrl+F12 to control the speed of DOSBox's emulation. A Patcher: Fixes bugs and can unlock incomplete parts of the game. 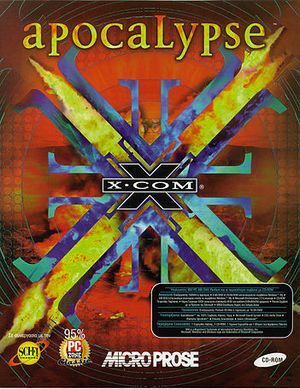 Effectively XcomUtil from earlier games remade for Apocalypse. 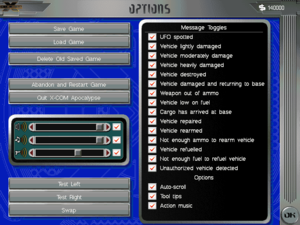 RoadWar: Rebalances the vehicle combat, adding more game emphases to it. Karadoc's Apoc Mod: Rebalances tactical missions, can make the both more fair and challenging. Additional mods and other files for Apocalypse can be downloaded at StrategyCore here. An open source reinterpretation of the game's engine that's currently in a pre-alpha state. Further details can be found on the project's official website, GitHub repository, and project forums. Use the Unofficial German Language Pack. Use the Apocalypse Spanish Patch. Hotseat. Was scrapped prior to release but can be enabled using A Patcher. Works surprisingly well for a unstable pre-alpha feature. Was scrapped prior to release. Can be enabled using A Patcher, however usually crashes immediately after selecting the option from the menu. The Steam version sometimes asks you to insert the CD into the drive. When it does so, the game can't be resumed. The Steam version is set to "Minimal Install" in order to conserver space. If copying files makes you feel nervous you can also run the installer on the ISO and have it overwright the install with the "huge" size. Certain files, such as the music and videos, will still remain on the disk however. You may want to copy these if problems continue. Be sure you performed the first fix first before attempting this one. Note the ISO image is no longer required to be mounted after doing one of these. Exactly like it sounds, cutscene playback is poor. Use this patch from StrategyCore user Bomb Bloke. Included smacker player may hang in DOSBox. This can be fixed by upgrading it to the latest version here. Batch scripts may also need to be edited depending on where the game is installed to. This game has issues with certain SVGA cards (both real and emulated). It can be fixed by using this patcher. Note this program requires Windows and will not run in DOSBox. Certain versions of the game shipped without the map files for the Alien Dimension. They can be downloaded here. Smacker Video Cutscenes remain on disk in the retail version. ↑ 2.0 2.1 File/folder structure within this directory reflects the path(s) listed for Windows and/or Steam game data (use Wine regedit to access Windows registry paths). Games with Steam Cloud support may store data in ~/.steam/steam/userdata/<user-id>/7660/ in addition to or instead of this directory. The app ID (7660) may differ in some cases. Treat backslashes as forward slashes. See the glossary page for details. This page was last edited on 26 April 2019, at 02:21.